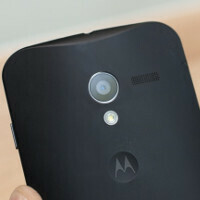 Remember how we expected to hear something official on the Moto X during an allegedly Motorola-hosted event yesterday? And do you also remember how that hope was ruthlessly extinguished subsequently? We do! So, guess what? Turns out that while we were told that the event is not necessarily about the Moto X, it did have a top Motorola exec handling it, and luckily – somebody caught it on video. 2. According to the Verizon roadmap that leaked yesterday, the launch of the device on the carrier's network is in less than two months, meaning that any prototyping stages are likely over. So what's next? We sit tight and wait. Just kidding, the comment section is at your raving convenience! As far as I can tell, you are wrong. Those are two damn different phones. One is the international variant, one is the US version. Stop confusing them. Note the high precision of the speakers on the back left of the previous leaks and the larger holes on the back right of the recent leaks. Different variants of the phone. It will not be that cheap plastic fatty phone with two sim cards we've seen leaked this past week. Wow. Thanks! Now I feel like an jerk for the first sentence. Haha. Sorry. I was just getting sick of the cheap plastic thick phone comments going around because of that dual SIM variant leak. That's a really creepy smile... Just saying. And with video capture now at 720p and even 1080p, viseos are still blurry and just a pain to watch. It looks like a different variant from what I've seen from the leaks. This is a good new! It would be bad if the exec was catched using an iPhone like the Samsung exec in Korea LOL!!! Yeah, I was trying to give reason to giving up my HTC One for it, but the specs just don't add up for me. But no, really, specs don't matter nearly as much anymore so long as the phone is good. First of all, this is not meant to be a "flagship" by any means. It's meant to be an affordable, customizable, ACCESSIBLE smartphone. Secondly, tell me how the Galaxy S3 lags all over the place. Spoiler alert: it doesn't. This is definitely not a flagship. It was never meant to be. All the hype and rumors built it up to be that, but Motorola and Google have always been working on a mid range device. Also, this definitely is future proof. My Galaxy S3 is future proof, dual core Snapdragon S4 with 2 GB of RAM, and it is buttery smooth. This is even more future proof, having the S4 Pro with Adreno 320, it's going to be one of the smoothest Android experiences out there. Cores =/= performance. At this point, processor speeds are negligible from each other. What really matters is the GPU (but even that is becoming irrelevant), and the Adreno 320 in the S4 Pro is a beast. Look at my new Moto X device, doesn't it look exactly just like the other four hundred in the market? Is it just me, or does this phone seem a bit like the DNA? Seems like the same design and material. From the back at least.